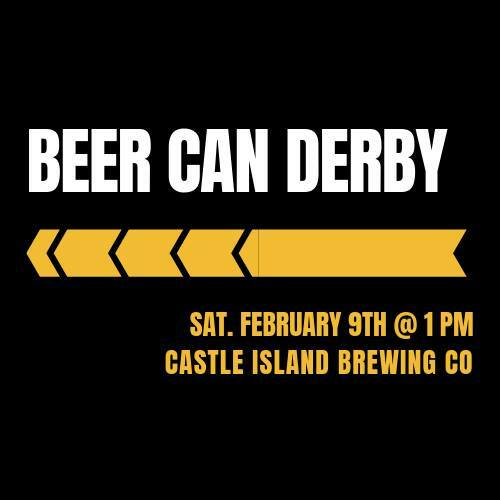 Castle Island Brewing Company presents their first ever BEER CAN DERBY. What’s a beer can derby, you ask? Well, it’s just like the classic ‘pinewood derby’ of your childhood scouting days, except with a Castle Island beer can instead of a block of wood. Simple enough, right? -Sorry, but the lil’ ones can stick to the scouts for their racing needs. You must be 21 or over to participate in this event. -The entry fee is $5 and includes your basic kit to get building. (One clean, unused Castle Island can, four wheels, and two axle assemblies.) YOU CAN ONLY REGISTER AND PICK UP YOUR KIT IN OUR TAPROOM. -Use as little or as much of the starter kit as you want, but all can components must come from a Castle Island Brewing Company can. The rest is up to you. -All race cars are gravity racers and can have no propulsion of any kind. -Check-in and inspection starts at 1 PM. They’ll announce the order of the first round at 1:30, post time for the first match-up is 1:55. Racing starts at 2 PM sharp. -There will be prizes for win, place, and show; as well as for best car design and best team name. Style points MATTER. More details to come. Sign-ups are limited; first come, first serve!